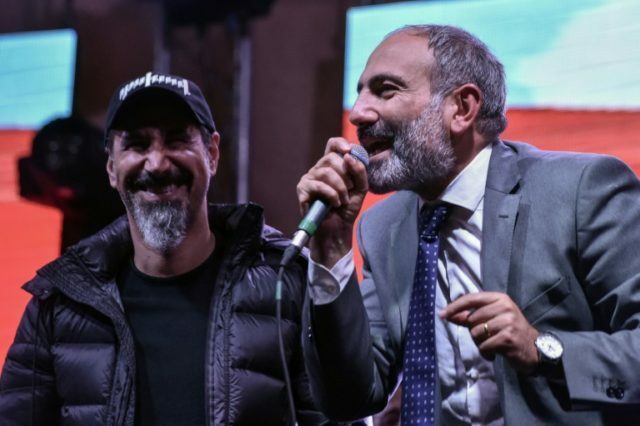 Yerevan (AFP) – Just three weeks ago, few would have thought that Nikol Pashinyan, a 42-year-old former newspaper editor who served time in jail, would transform Armenia’s political landscape and become its next leader. Over the past weeks, Pashinyan — the head of a small opposition party — brought tens of thousands of people to the streets of the poor South Caucasus nation, accusing veteran leader Serzh Sarkisian of a power grab and forcing him to resign as prime minister after a decade in power. Sporting a salt and pepper beard, a tan and a baseball cap, Armenia’s rising political star channelled widespread desire for change into a broad protest movement. The father-of-four has earned a reputation as a man of the people, wearing his trademark camouflage T-shirt during protests and carrying a massive rucksack which he says contains “everything I need” — including a chocolate bar and a laptop. After Sarkisian’s resignation last month following ten days of peaceful protests, the opposition lawmaker said only he could be the next prime minister. Crowds of villagers poured onto the streets to greet Pashinyan, offering him fresh bread and berries, as he travelled to rallies across the country. “The spring of liberation has come to Armenia,” one Pashinyan supporter, 56-year-old Sona Paremuzyan, told AFP in Yerevan. After the ruling Republican Party narrowly blocked his first bid for prime minister on May 1 despite initially promising not to stand in the way, Pashinyan staged a general strike that shut down the capital Yerevan and other cities. Pashinyan only called an end to the rallies after the Republicans said they would back his candidacy in a second attempt on Tuesday. Before the start of the protests last month, he walked some 200 kilometres (125 miles) from Gyumri — Armenia’s second city — to Yerevan with his supporters, often sleeping in the open. His creativity was visible during a parliamentary election campaign last year, when he went into courtyards, clambered onto the roofs of garages and stood on benches to deliver speeches. Ahead of Tuesday’s vote, however, he swapped his street attire for a sleek suit, transforming himself into a polished politician with a soft handshake and a bashful smile. Before the current rallies some have called a “revolution of love”, Pashinyan was mostly associated with the tragic events following the 2008 presidential vote that first brought Sarkisian to power, when 10 people died in clashes between police and supporters of the defeated opposition candidate. Authorities at the time accused Pashinyan of seeking to seize power and provoking mass riots, claims he has denied. He went into hiding but surrendered in 2009. He was released from jail in 2011 under a prisoner amnesty scheme and elected to parliament the next year. Analyst Vigen Hakobyan called Pashinyan a “classic revolutionary” who is ready to act decisively without hesitation. David Alaverdyan, chief editor of a local news agency who studied with Pashinyan, praised his “quick wit, rich language and humour”. “He’s got a certain charm that attracts people,” he told AFP. Opponents from the ruling Republican Party have accused Pashinyan — who says he wants good relations with both Russia and the West — of being unpredictable and lacking a clear programme and ideology. Pashinyan was born in 1975 in the small resort town of Ijevan in northern Armenia during the Soviet era. He studied journalism at Yerevan State University but was expelled in 1995. He worked as a reporter and newspaper editor before getting involved in politics. Pashinyan set up the Civil Contract party, which entered parliament in 2017 as part of the opposition coalition. With his fiery rhetoric and penchant for asking awkward questions, Pashinyan quickly became a thorn in the side of the ruling party. Pashinyan said the protest movement empowered ordinary Armenians, showing them they could determine the future of their country. “Prime ministers will come and go,” he told a rally in Yerevan.